Published for Instituto Figuerola de Historia y Ciencias Sociales, Universidad Carlos III de Madrid. 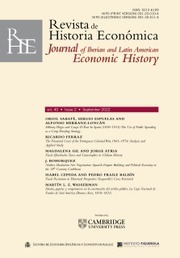 The Revista de Historia Económica - Journal of Iberian and Latin American Economic History (RHE-JILAEH) provides a global forum for nation specific discussions on economic history, placed within international frameworks. RHE-JILAEH publishes original research papers on economic history, economic thought and areas of economics concerned with long-term analysis of the Iberian and Latin American regions. Emphasis is given to work that places this research in a global context, particularly papers that adopt international comparative approaches. Reflecting the journal's strong commitment to internationalise the ongoing debates in Iberian and Latin American economic history, it publishes articles in English and Spanish.